Now I will leave you with some picture of my trip in Canada. YES they had their share of snow this year these picture was this past weekend and I think they will have snow till June they way the bank are so tall. Top picture. The oldest to the youngest and mom in the center YES I’m the baby in the family. Yes she was very surprise but happy to have all her 4 daughter home all together. All the Maple trees with the little bucket to collect the sugar water to make all that good stuff with maple. Butter, Surgar, Taffy, Syrup oh how sweet and good. FYI this is lots of snow for this time of the year not normal but I think everyone in the east coast had a big winter. This is in the little Village in St-Andre, New Brunswick Canada yes that is where I was born and raise. Well my friends this is it for now. If you send me a e-mail in the past week and I didn’t answer you yet please re-send it must a got lost. I think I answer all e-mail yesterday from the past week. Thank YOU so much for your patience. I appreciate all your support. Hi Frenchie, Love the card. Its simple yet beautiful! I didn't realize you were from N.B. I am from, (born & raised), in N.S. Yes, winter has been harsh here this year. Glad you were able to get home and spend time with your family. I'm sure your Mom was thrilled! Great card design & loved seeing your pictures. I also am 1of 4 daughters, the oldest & not from Canada. But I can relate to the fun aspect when we all get together! 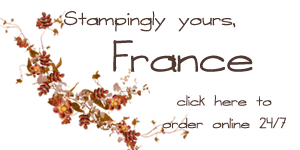 Frenchie, I just became a Stampin Up demonstrator but I have been watching your tutorials for a long long time. LOVE THEM!! I love to make cards and hope to be as successful as you some day. I am still learning and your tutorials help me tremendously!! I live in Idaho but I was born in Magrath Alberta Canada so now I feel more akin to you than ever! lol Thanks for the inspiration!! You are right about the snow in NB. Here in Fredericton we have so much we still cannot see our street from inside our home! Dangerous pulling out of driveways and streets. What a winter but spring is on the way! Such a nice picture of your family, you Mum must have been thrilled. What fun when sisters get together, isn't it? I just enjoyed a few weeks with my remaining sisters AND brothers – the 6 of us range in age from 72 to 85…great times. And your picture of the maple syrup on snow brought back memories. We had a “sugarbush” and made syrup and candies when I was growing up in southwestern New York state. Love your videos and am going to make a similar card using this technique. Thanks for all your teaching.